True adventurers wrestle the essence of nature into a lowball glass and drink their victory. The Campground, the pocket bar that grew into an established love letter to the outdoors, opened in the West Bottoms this past December. Ciesiel and his wife, Cristin Llewellyn, created their version of a nature preserve in the former Genessee Royale space (1531 Genessee). It’s a cozy nook with a copper-topped bar, framed landscapes and a fetching set of folding, camping stools at the front entrance. They serve food from chef Craig Howard of Howard’s Grocery, Cafe and Catering, and make tightly focused drinks that treasure the obscure. 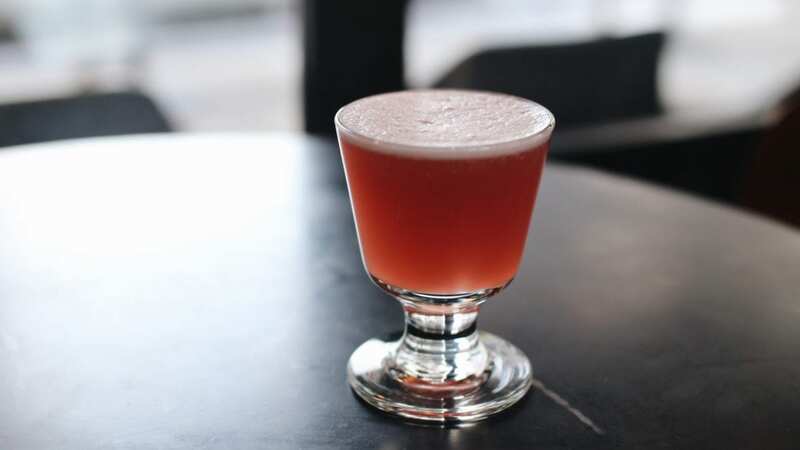 The gimlet, a pink-hued conundrum, has been on the menu since the beginning. A gimlet is a classic gin cocktail traditionally made with lime and simple syrup. Ciesel is not afraid to get weird. The gimlet uses Zirbenz Stone Pine Liqueur of The Alps, a cordial from Austria made from the fruit of a Stone Pine tree. The reason that The Campground “smells like a pine tree when people walk in” is that Ciesiel infuses gin on the back bar using tea bags with foraged Spring Fir tree tips from Juniper Ridge, a California-based company. As for those of us still making drinks in our shed, Ciesiel encourages anyone that steps behind the bar to remember that this is about coming together for a drink. The Campground is open from 11 a.m. to 11 p.m. Monday and Thursday (it’s closed Tuesday and Wednesday), 11 a.m. to midnight Friday, 10 a.m. to midnight Saturday, and 10 a.m to 3 p.m. Sunday. Ciesiel: I like that this drink is not true to a gimlet. It’s nice and tart. And I love that it’s pink because that throws people off. Drop one Juniper Ridge Douglas Fir Spring Tip tea bag (it’s readily available online) inside a 750-milliliter bottle of gin. After 20 to 30 minutes, the gin will turn the color of ha,y and that’s when you know the infusion is ready. Pour the gin into a separate container. Remove the tea bag and then clean the bottle. You can then refill the bottle with the infused gin. This is a rich simple syrup, which means that you’re going to use a 2-to-1 ratio of sugar to water, as opposed to equal parts. I’m a fan of making extra, because then you have simple syrup on hand — it keeps in a closed container in the fridge for up to a month — for other drinks or to make a few more dozen gimlets. Pour 1 cup of sugar and ½ cup of water into a small saucepan. Turn the heat to medium until the sugar is completely dissolved in the water. The liquid should be completely clear. Take it off the heat and allow the syrup to cool before transferring it to a sealed container. Fill a cocktail shaker with ice. Pour in the gin, Zirbenz, lime juice and simple syrup. Shake for approximately 10 seconds to properly chill and dilute the drink with ice. Served in a chilled cocktail glass of your choice.